KATHMANDU, April 01: Kathmandu Metropolitan City (KMC) it will launch the free wifi service at various heritage sites of Kathmandu. Including Hanumandhoka Durba Square, Pashupatinath area, Swayambhunath Stupa, Bauddhanath Stupa, Balaju Park and Shankhapark. The KMC and internet service provider WorldLink signed an agreement to launch the service Sunday. 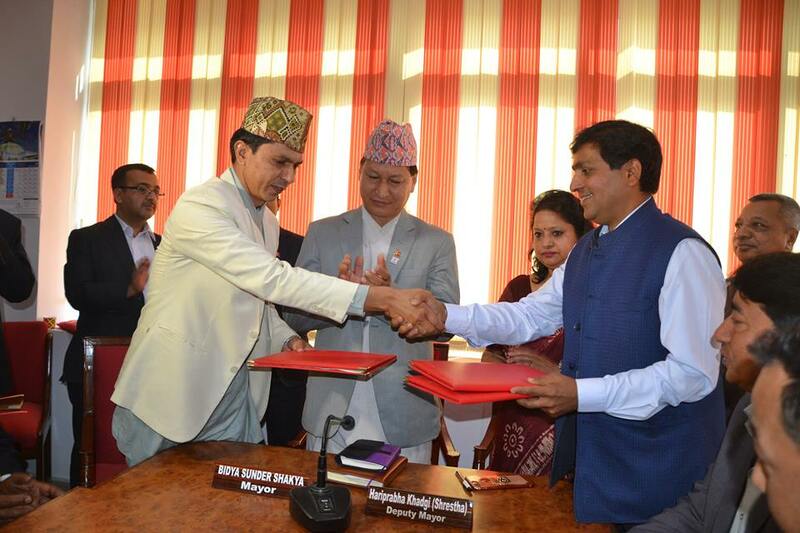 KMC Chief Administrative Officer, Dhaniram Sharma and the company’s director Bijaya Kumar Jalan signed the contract. On this occasion, Mayor Bidya Sundar Shakya, Deputy Mayor Hariprabha Khadgi Shrestha and Coordinator of Information Technology Committee, Ishwor Dangol was the participant. The company will provide free wifi service on its own expenses within next 60 days now. A person can get the free internet connection for 30 minutes a day for free at these places. The company says 10 mbps bandwidth will be given to each place on the basis of the number of minimum visitors at the place. There will be 11 access points at Pashupati, four at Bauddha, two at Shankhapark, seven at Balaju Park, five at Swayambhu and nine at Basantapur.